Not only do you have to feed, clothe and generally look after the physical welfare of children. You have to entertain them as well. Kids have low boredom thresholds and short attention spans, so this is no easy task. The good news is that there are lots of things you can do that are fun for the adults as well. Here are some of the things I have done with my son (now aged 7) over the last few years. I’m interested in science and computers, so some of them are unashamedly geeky. I hope that it gives you some ideas for things to do with your own kids. Or other people’s kids (other people’s kids are the best, you can give them back when you have had enough). Note that some of the links below are Amazon affiliate links. If you buy something, I get commission to spend on more toys! Other vendors are available. Potato cannons are great fun. Ram a spud down the barrel, spray some butane, hairspray or similar into the combustion chamber, create a spark and WHOOOOMP. Your spud can go over 100 metres. If that doesn’t put a big smile on your face, you must be clinically dead. You can see one in action here. They are relatively easy to make. Various plans and videos are readily available on the Internet. Mine was based on these plans and the parts were sourced from the UK supplier they recommend. 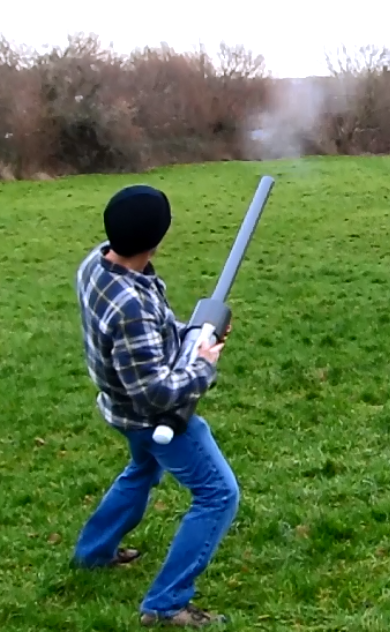 Disclaimer: A potato cannon is potentially very dangerous (the clue is in the word ‘cannon’) so exercise common sense. The fumes from the glue during construction are potent. Do your construction in a well ventilated area and avoid sparks. Use pressure rated materials and don’t use high power fuels such as acetylene. Your spud cannon could explode. The spud comes out of the barrel at great speed. Never point it at a living thing. Firing the gun is definitely a job for an adult. The Scratch programming environment is ideally suited for creating simple games and is a fun and free way to learn to program. Programs are constructed by snapping together colour coded blocks – there is no syntax to learn and very little typing. Within an hour children can go from nothing to having created a simple example game with graphics and sound. 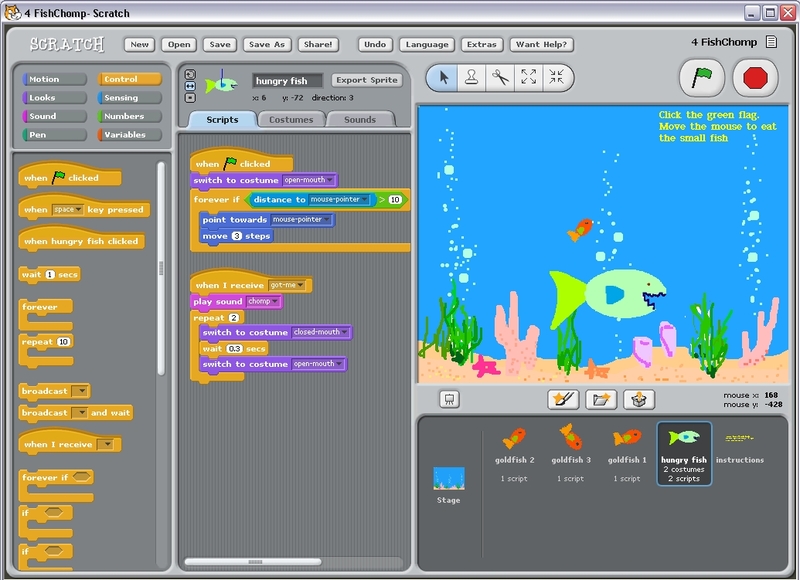 Children too young for Scratch can still play simple programming games. 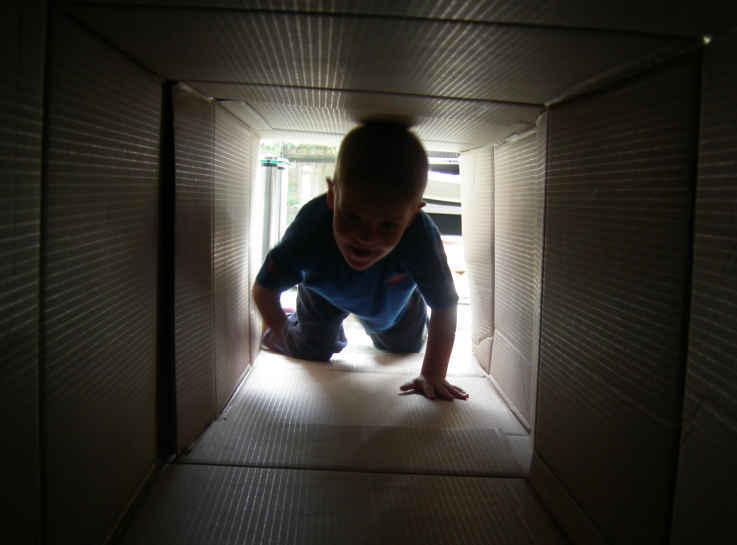 Children have a habit of ignoring expensive presents in favour of the boxes they came in. We had a load of cardboard boxes and packing tape left over from moving house. We used them to make various constructions, including a train and a house. Blowing bubbles is fun. The bigger the bubble, the more fun! We purchased a mega bubble kit. It contains a bubble wand, some instructions and the secret ingredients list for making mega bubbles (hint: include some cornflower to make the bubbles more durable). Every child and adult should have the chance to gaze in wonder at the stars from time to time. Ideally do your star gazing well away from city lights, on a cloudless day when there is no moon. The very impressive Star Walk astronomy app (for iOS and Android) will tell you where the satellites, planets and stars are. The best time to spot satellites is shortly after sunset. 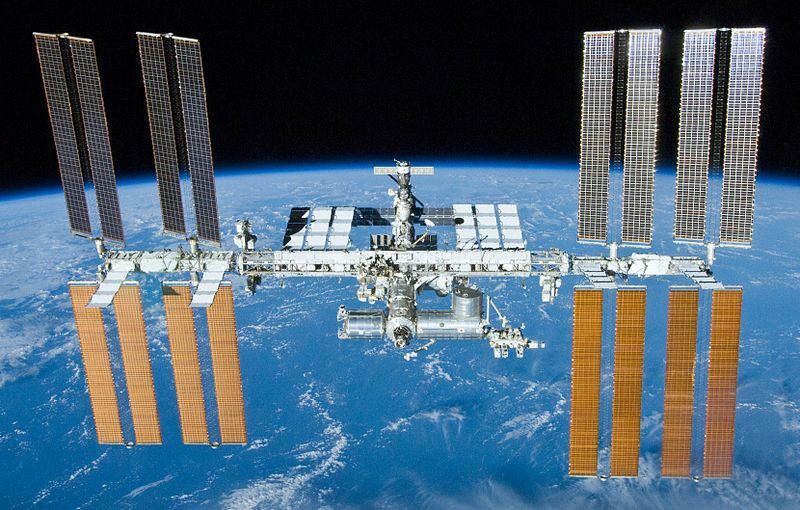 You can use ISSTracker.com to work out when the International Space Station is passing overhead. You can sometimes see several of Jupiter’s moons just with binoculars. If there is a full moon, look at that instead. Tip: If you have a trampoline in your garden, that can be a comfy place to lie back and look at the stars. 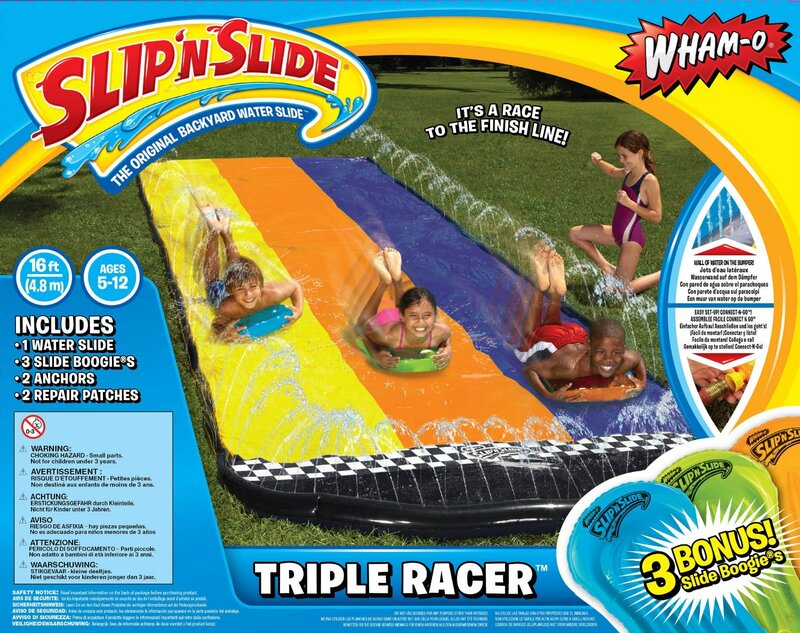 Water slides can be great fun, especially if you have a slope in your garden. You just need a big sheet of thick plastic, a hose pipe and some washing up soap. The Slip N Slide slides aren’t particularly well designed or made, but the plastic sheet has lasted ok.
For the more ambitious, there are some instructions on how to make your own monster slide here. Star Wars is an essential part of any budding geek’s education. But I think episode 3 is too dark for a 7 year old, so we have only watched episodes 4, 5 and 6 (the best ones!) so far. More on this topic over at Scott Hanselman’s blog. 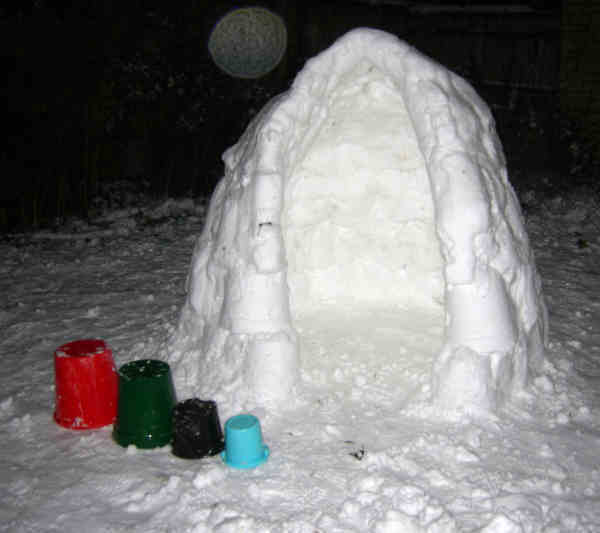 If you get a good amount of snow (rare in the UK) you can make your own igloo. After a couple of attempts at this, I believe the best approach is to make ‘bricks’ by packing loose snow into boxes. Each ring of bricks being of smaller diameter than the one below. Ideally use rectangular/square boxes of varying sizes, with the biggest ‘bricks’ at the bottom. More details here. I love Lego and I think it is great for encouraging creativity in kids. But, in becoming the corporate titan it now is, Lego seems to have lost its way a bit (particularly in their pink and pony themed ‘friends’ range for girls, ugh). When I was a child there were few kits or different types of pieces. Mostly I had red, white and blue 2×4 bricks and I used my imagination to come up with my own designs. (Interesting trivia, apparently the founder of Lego was a pacifist and he didn’t want little boys making tanks, so that is why there were originally no green or brown bricks.) But now Lego seems to be all about following instructions and finding the right piece. I bought loads of 2×4 bricks and other basic pieces from the bricklink.com website. The website UI is a bit confusing at first, but once you get used to it, it is a great resource for buying Lego relatively cheaply. 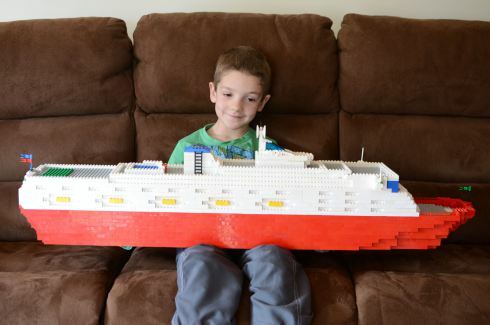 You can also buy second-hand Lego from e-bay. I just kept bidding low on job-lots and picked up a few bargains (plus one rather disgusting consignment that got sent straight back for a refund). Here is something I made recently, mostly from 2×4 bricks (I got a bit carried away). Tip: You can wash second-hand Lego by putting it in a string bag in the dishwasher. But don’t put it on maximum temperature, unless you want a Salvador Dali effect! If you are going to buy new kits (hard to avoid) get the Lego Creator ones, as they generally allow you to create at least 3 different models from each kit. This means better value for money and it encourages kids to pull their creations apart and make new things from them. 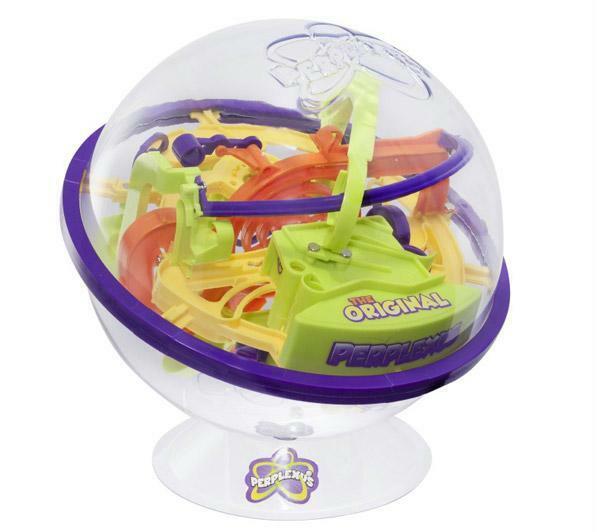 The Crazy Action Contraptions kit is also good fun. My son loves playing computer games. There are a lot of great apps for kids. Here are some of the better ones. I also think the open and constructive nature of Minecraft makes it a good game for children. But, be warned, it is very addictive. 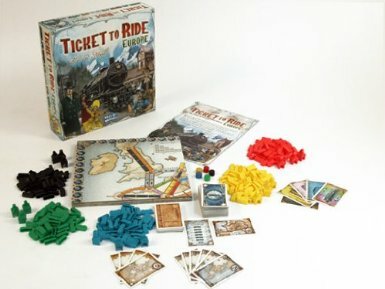 There is also a good list of ‘analogue’ games at gameskidsplay.net. You can make a scale model of the solar system with household items to show just how vast the solar system is. This link allows you to work out the size and distance of each planet based on the size you choose for the sun. For example, setting the size of the sun to 300mm (about the size of a soccer ball) means an earth of about 3mm (about the size of a peppercorn) at 32m. Choose the size of your sun according the items or space you have available. Tip: If you are doing it in your garden you need either a very small sun or a very large garden! If that isn’t mind boggling enough, try this flash simulation which goes from subatomic particles to the whole universe (requires Flash). 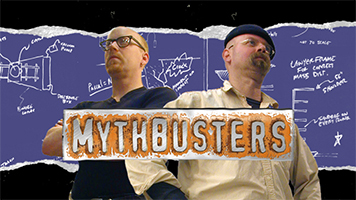 My son and I both love the Discovery Channel TV series ‘Mythbusters’. In case you aren’t familiar with the premise: the hosts try to replicate various myths to see if they hold any truth (e.g. are you safe from bullets under water?, would a penny dropped from a skyscraper kill you?). It’s basically the scientific method disguised as an entertainment show. And very entertaining it is to. If you can’t get it on your TV, you can see lots of excerpts on Youtube. Tip: Many of the episodes are not suitable for young children (e.g. is it possible to decapitate someone with a ceiling fan?). So check them out first. 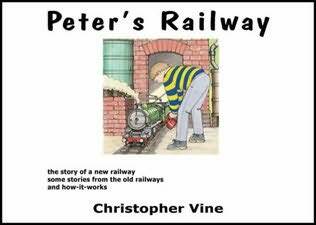 Peter’s Railway is a wonderful series of books about a boy and his grandfather building a miniature railway. They combine quite a lot of science and engineering with a great story and illustrations. Take an empty plastic 2 litre drink bottle. Fill it about a quarter full of water. Find a cork that will fit tightly. Get a foot pump with a needle valve and push it through the cork. Push the cork into the bottle. Point the bottle rocket in the air. Keep pumping until it takes off. It can go surprisingly high and fast in a gratifying demonstration of Newton’s third law. More information here. Disclaimer: Half a kg of water travelling at 10+ metres per second could do some damage, so be careful and make sure it doesn’t fall over during pumping. I used to play trump cards when I was a kid. In case you aren’t familiar with the concept, you have a pack of cards on a certain theme (e.g. sports cars or jet fighters) each with certain attributes (e.g. top speed or horsepower). When It is your go, you call out what you think is the best attribute of your top card. If it is better than your opponent’s top card you take his card and go again. If not he takes your card and it is his turn to choose. The game continues until one player has all the cards. The best thing about trumps is that it is teaching kids to understand numbers on the sly. It certainly helped my son to learn his numbers. Tip: Top Trumps used to be the best brand of trump cards in my youth. Now they have gone for all sort of lame merchandising tie-ins such as Harry Potter and Star Wars. Sigh. The Ace trumps brand is better (and cheaper). 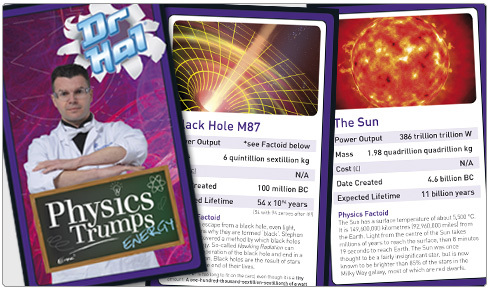 Or you can go for the fantastically geeky Dr Hal’s Physics trumps. Playing 21/Pontoon/Blackjack with your kids is also a good way to improve their addition. I heard that Warren Buffet put a fruit machine in his house to teach his children about the folly of gambling. So I sometimes offer my son to play double or quits with his some of his pocket money. If he accepts, we flick the coin. If he wins I double his money and he has the option to play again. If he loses I keep his money. The first few times we played, he kept playing until he lost his money. Now he has learnt a bit about probability (the hard way) and won’t play, or perhaps just 1 flick of the coin. Result! Tip: If they lose, don’t give them their money back. No matter how much they plead. Otherwise they will learn entirely the wrong lesson. Tough love. 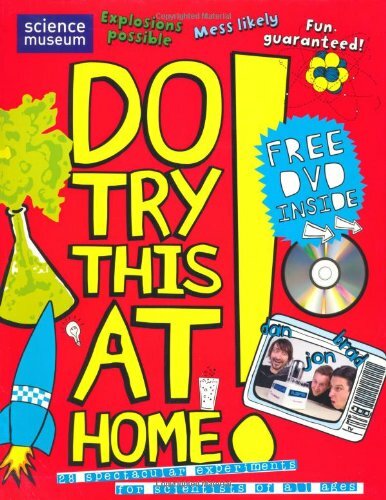 There are plenty of books with experiments you can do with kids at home, e.g. Do try this at home by the Science Museum. We designated our son a corner of the garden as his. He has spent many a happy hour there digging holes and filling them in. Sometimes the simplest things in life are the best. Most things in fine powder form will combust very rapidly (big surface area). Kids love explosions. We poured some icing sugar down a long carboard cylinder onto a tee-light candle to make a satisfying ‘whoomp’. Disclaimer: Try this outside and entirely at your own risk. It is relatively easy to make a short stop motion animation using a digital camera (ideally on a tripod) plus some toys or Lego. You can use free software, such as Windows Movie Maker, to join the stills into a movie. There are lots of videos showing how to this on YouTube, for example. 3D mazes are fiendishly difficult and quite addictive. Only allowing myself a few seconds per move. Starting with less pieces (e.g. no queen or no castles). Allowing them to change sides part way through. 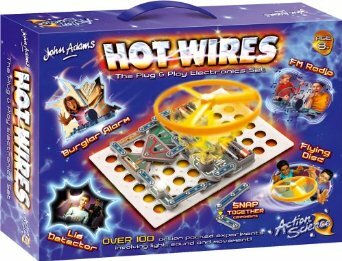 We bought our son the Hot Wires electronics kit and he has played with it loads. The kits is surprisingly well made, but the instructions aren’t great. They clearly show how to make 100 different circuits, but they don’t really explain how any of the circuits or components work. However my son was quickly building his own simple circuits and learning by trial and error. Whatever geeky things you are into, there are almost certainly some videos about it on YouTube. I particular like the Open University 60-second adventures in Astronomy series. Tip: I strongly recommend you turn ‘Safety’ on if you are browsing YouTube with kids (or your parents, come to think of it). I think it is important that kids know food doesn’t appear by magic in supermarkets. 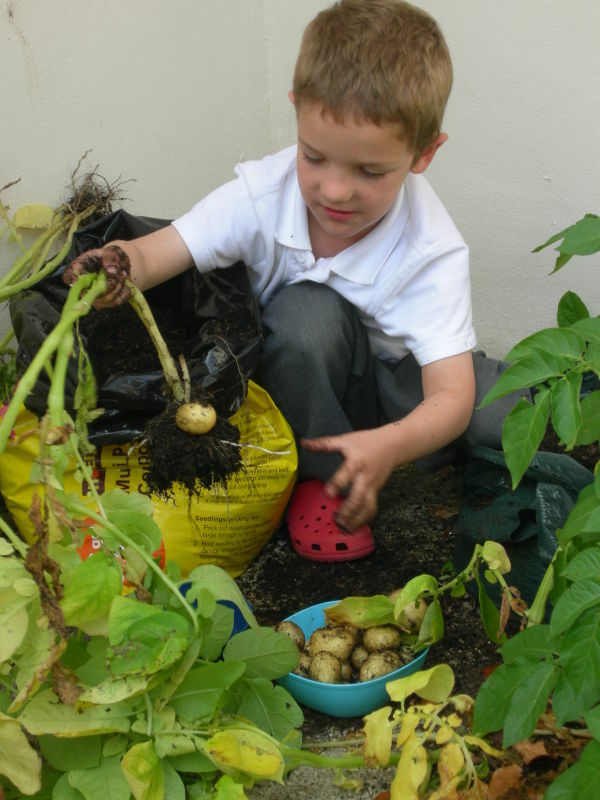 Potatoes are pretty easy to grow. My son likes Monopoly (interestingly, a game originally invented by Quakers to teach people about the evils of property ownership). All the dice rolling and money changing hands is good for his numeracy. But it is a rather brutal game that can go on forever. I prefer Ticket to ride, which he is also very keen on. This is a German-style game of strategy that can be played in an hour and you have no idea who has won until the very end. We have also had a lot of fun with Cube Quest, which is a good mix of dexterity and tactics. We had some drain pipes and guttering left over from renovating our house. Rather than throw them out we let our son play with them. 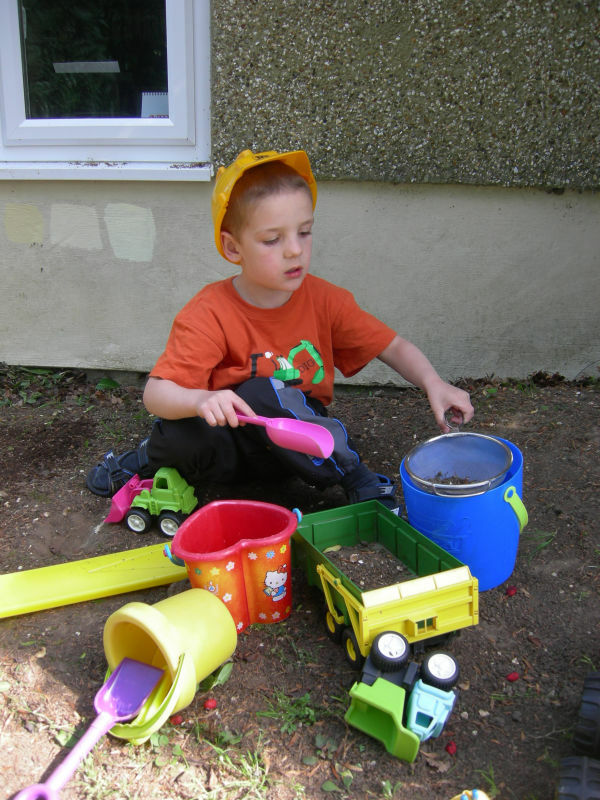 He has spent many happy hours connecting them up and putting toy cars, balls and water down them. 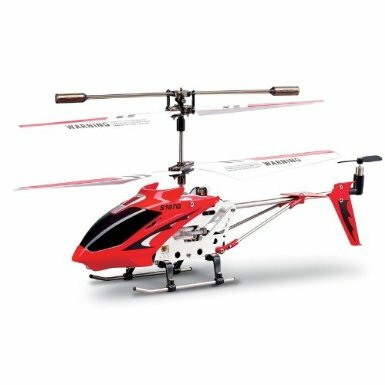 The latest remote control helicopters are amazing. I have a little Syma indoor RC helicopter that I bought for about £15. It flies amazingly well and it is still going strong after countless crashes onto a tile floor. I find it hard to believe such an amazing piece of engineering is so cheap. I also have its big brother, but I find the indoor version much easier to fly (and less dangerous!). 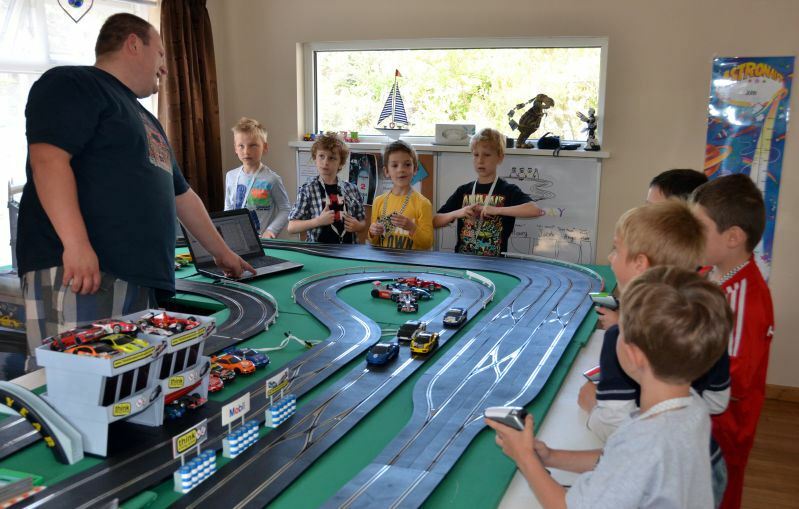 For our son’s birthday we hired some guys to set up their Scalextric track in our house. The kids had so much fun. It was unanimously declared ‘best party ever’. Tip: Book an extra 30 minutes for the adults at the end! 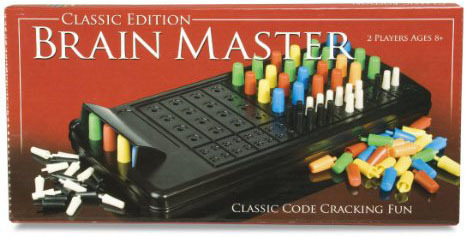 My son enjoys playing this classic logic game from my youth. It can be a bit trying when you are trying to guess the colour and they score you wrong, but you can award yourself bonus marks if you can spot that have scored you wrong without seeing the code! I’m not very good at making things, apart from software. But my father is. 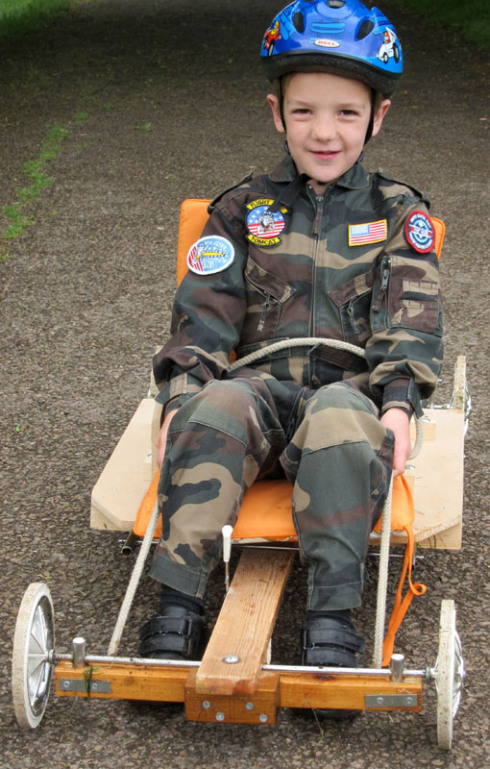 He made my son this rather splendid go-kart. I just wish it was big enough for me. Disclaimer: It is possible to flip a go-kart. We proved it. So do wear some protective gear. What fun and geeky things have you done with kids? Please add a comment below. This entry was posted in off topic, software and tagged animation, bubbles, chess, children, electronics, entertain, fun, games, geeky, go kart, home experiments, igloo, iss, kids, lego, mastermind, mythbusters, peter's railway, potato cannon, rc helicopter, scalextric, science, scratch, star gazing, trump cards, water slide on 31 January 2014 by Andy Brice.